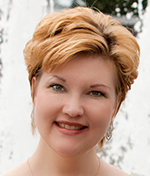 Karyn is very active in Vancouver as a singer, director, adjudicator, and music instructor. Some of her favourite performances include Madame Giry in The Phantom of the Opera, Hansel in Hansel and Gretel, Eva Perón in Evita and the Second Lady in The Magic Flute. Karyn can often be seen in concert performing a mixture of musical theatre, pop, art song and opera. Karyn has directed Amahl and the Night Visitors for the Vancouver Academy of Music as well as several evenings of opera scenes. She was on the faculty at Capilano University as a voice instructor for four years and taught voice, piano and theory at the Walnut Grove/Guildford School of Music for nine years. She was head of voice for Stagecraft Theatre School for eight years and Karyn currently teaches at her home studio, Vocalis Music. Karyn has adjudicated and given masterclasses in voice and musical theatre in cities across Canada including Brandon, MB, Fort MacMurray, AB, and Victoria, Duncan, Penticton, Williams Lake, Campbell River, Terrace and Burnary in BC. Karyn earned a Bachelor of Music Degree in Voice Performance and a Master of Music in Opera from the University of British Columbia. She also earned Diplomas in Musical Theatre from Grant MacEwan College and the Banff School of Fine Arts. Karyn is a proud member of the National Association of Teachers of Singing (NATS), and is delighted to be a part of the Vancouver Chamber Choir!